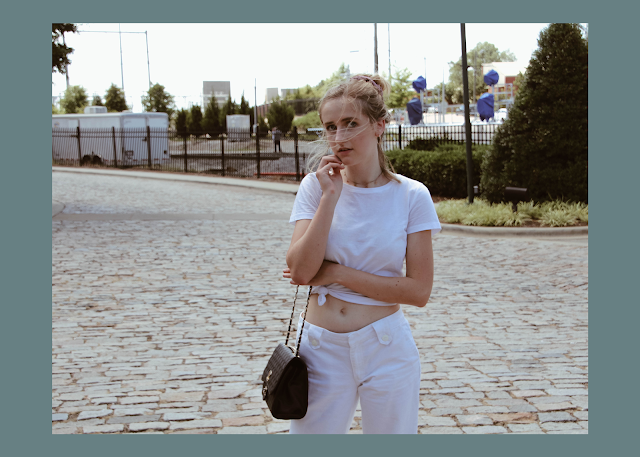 One of my favorite pieces for the summer has been a good pair of white jeans. I thrifted mine, but some of my other favorites I own are from Topshop and Asos. One of the most popular trends I ha ev seen this season is monochromatic. Monochromatic in fashion means to pair items of the same shade to create a cohesive look. The trend of Monochromatic has popped up in colors like pink, blue, yellow, and white this season. I really fell in love with the white on white look. It became one of my go-tos. It is so easy when all you have to do is through on any white top (half of my wardrobe), white pants, and a classic pair of white sneakers or any other pair of white shoes of your choice. Because of how easy this look is to accomplish, it is honestly one of the best things to have in your wardrobe in this season. Having a look like this in your wardrobe can create a simple staple by having an effortless look that is chic but still casual.